First off, I have now been listed as an artist on Epilogue.net! Epilogue is a huge online fantasy art portal that features quality fantasy artists, and the advisory board includes legends of fantasy art Boris Vallejo, Julie Bell, and amazing Dragonlance/DnD artist (and Masters of Fantasy juror) Larry Elmore. Don Maitz, who is credited with designing the Captain Morgan pirate, is also on the board and displays his art on the site. This makes me feel all warm and fuzzy, because although anyone can be a member for the site/forums/etc, artists and artworks are screened for approval. I only have a few pieces in my section right now, but hope to add more and a print sale section soon! You can find me listed in the fantasy art galleries under Amanda Christine Shelton. Also, after over a year of being wishy-washy about one bit of paperwork- I have finally set up my system for this! 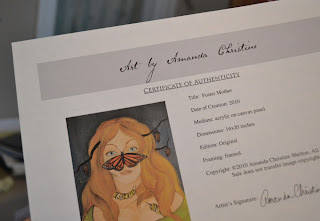 Certificates of Authenticity are now included with all of my original artworks and print editions. As an artist who paints women and animals, which are pretty common motifs, I have run across works that are of similar subject matter pretty often in my local area, and I get asked more often from collectors for this little piece of paper to accompany my work. So now, when you buy a print or original you will have everything you need to know about your investment in one handy little place! all the information you need on your art! What would you like to see in the new year?